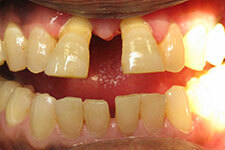 We would like to share with you some photos of our existing practice patients restorative outcomes. For privacy of these patients we ask if full face and/or "just teeth" pictures may be displayed.Therefore, you may see either one or both views. This case is a combination of all porcelain crown restoring a broken tooth and a bonding on the adjacent tooth to enhance the esthetic appearance. This patient requested a composite chair-side veneers to close the "gap" between teeth and correct uneven teeth contours. 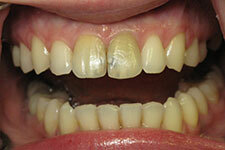 This patient wanted to improve the position of her front teeth that were a bit shifted and worn. 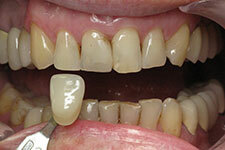 She also had a missing front tooth that was replaced with the implant and theall ceramic crown. 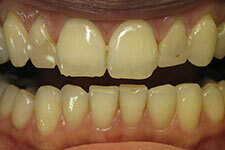 The teeth were treated with all ceramic crowns to give the patient a more beautiful smile. 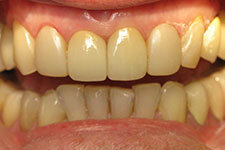 Patient wanted to improve her smile and make her teeth a bit lighter. This case is a combination of two front teeth ceramic crowns and thechair side composite veneers (cosmetic bondings) on the adjacent teeth. 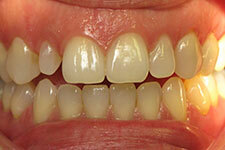 Two all ceramic crowns on her front teeth greatly improved her smile and confidence. 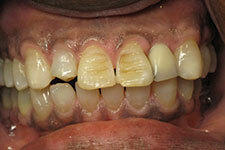 This patient wanted to improveappearance of his front teeth.ove appearance of his front teeth. He wanted to do minimally invasive treatment on his two front teeth and chose a cosmetic bonding.This procedure was done in the office in one appointment.The final improvement came after placing a crown on the short tooth. 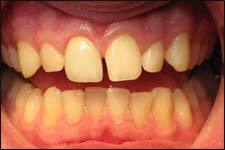 This patient had uneven spacing between his lower front teeth but did not want to do crowns to close the spaces. 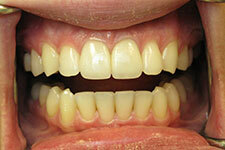 He chose to do composite veneers(bondings)on his lower front teeth to close these spaces. The procedure was done in one appointment. 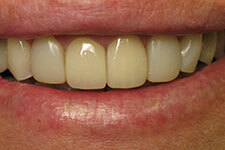 This patient wanted to improve her smile by changing the appearance of some of her front teeth. 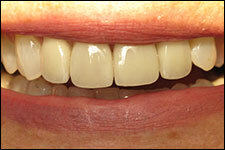 The composite veneers(bondings) were placed on her front teeth to improveoverall appearance of her smile. 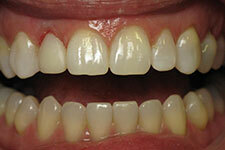 Patient wanted to improve the appearance one of her front teeth. Immediately after placing a composite bonding. 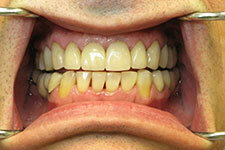 This patient wanted to haveimmediate change in appearance of her smile. Due to her gum disease the choice of treatment was the extraction of her front upper teeth and placement of immediate partial denture. Immediately after the extractions and denture delivery. 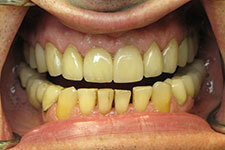 Patient wanted to improve his smile by changing the appearance of one of his front teeth. 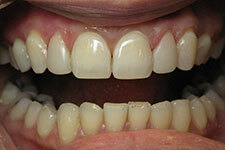 Ametal free crown was made for the dark tooth which greatly improved his appearance and confidence when he smiles. Patient "L" Wanted to improve appearance of his front tooth. We did a filling. Patient "M" has not smiled with confidence for a long time. We placed a fixed bridge on his front teeth. Patient " N" did not like his old denture teeth. We made a new removable partial denture. Patient "P" . This lady disliked her older bridge appearance and we had some concerns about her teeth condition under the old crowns as well. Patient " Q". This yound lady was not happy with her smile. After all necessary procedures, we placed 6 front crowns. 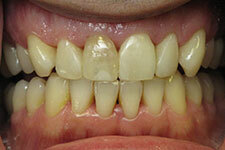 Patient "R" has never liked his front teeth appearance but was hesitant for years to change it. 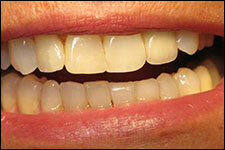 Finally, he could smile with more confidence after a crown and a composite chairside veneer placed on two front teeth. Patient "S" is your typical teenager! 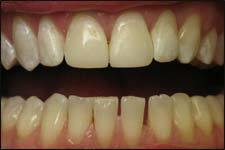 She was not satisfied with her smile after ortho treatment and wanted to close the remaining spaces between her front teeth. I would like to point out here that her orthodontic treatment was exceptionally successful otherwise and it is not alway possible to close all the spaces by braces. Patient "T" aways wanted to make her smile more attractive and it was accomplished in 2 appointments with the very conservative chair-side veneers on her 4 front teeth. 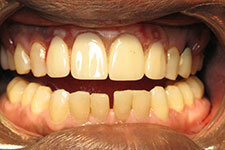 Patient "U" was never happy with her removable dentures and wanted something" permanent" in her mouth. This patient treatment took us 2 years to complete and was a result of collaboration with a great local periodontist, Dr. Patrick Angelo, and Distinctive Dental Studio talented dental technicians. 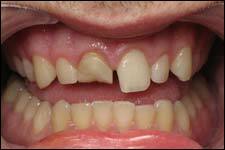 Patient has received a full upper arch implant supported bridge. Patient " V" was shy to smile because of her two front teeth appearance. 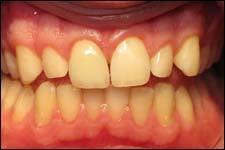 After all necessary basic preparatory treatment, two all ceramic crowns were placed on her teeth. Patient "W" wanted to feel more confident when he smiled. 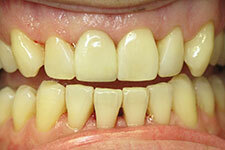 Even though only partial improvement was achieved at this stage, patient is happier than ever before. 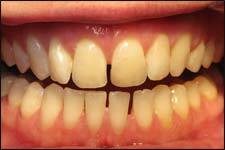 Patient "X" dreamed about her beautiful smile before her wedding and we helped her! This case involved 6 front all ceramic crowns with a beautiful talented work of dental technicians from Ottawa Dental Laboratory. Patient "Y" was embarassed to smile with her dark front teeth. Due to previous carious destruction and multiple dental restorations on these teeth, we had to place two all ceramic crowns.